The kitchen is often the showcase piece of a home. Whether it’s preparing meals for your family or entertaining a small group of friends, we spend a TON of time in the kitchen. We will be guiding you through the hectic world of kitchen makeovers where the possibilities are endless and the options are limitless. Let’s start off with your countertops, we’ll dive deep into finding the perfect balance of aesthetics and practicality. Granite countertops are beautiful, durable and heat-resistant. 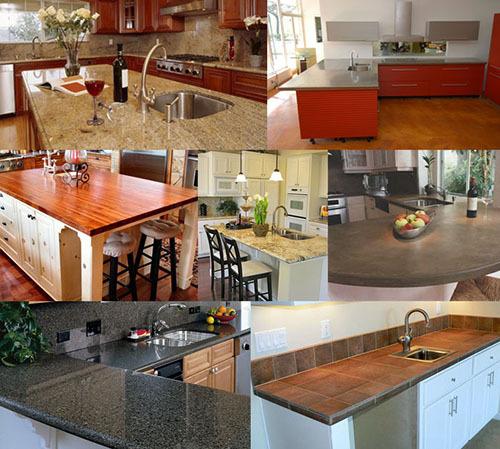 They come in an abundance of styles, colors and prices and have become one of the most commonly used countertop materials in kitchens all over the world. One downside is that because they are a natural stone, they need to be resealed from time to time. Overall, granite countertops look good in any kitchen and should always be considered if you’re looking for a practical but gorgeous countertop. Butcher Block countertops add a warm and cozy feeling to any kitchen. While the surface itself is somewhat delicate, it is still considered extremely durable as any scratches can be easily sanded and sealed with mineral oil for a brand new look. One of the coolest features of this countertop is how it moonlights as the world’s largest cutting board! Marble countertops are absolutely breathtaking and provide an air of wealth to any kitchen space. However, marble is expensive and would not be considered durable by any means. It chips and stains easily and needs to be manicured often in order to keep it looking like new. All of that being said, if you want a top of the line, gorgeous countertop for your kitchen and you have a high budget, marble should be seriously considered as your first option. Despite concrete being known as a hard and somewhat resilient surface, when applied as a countertop, it takes some work to keep it looking pristine. Most concrete countertops are custom made so they can be dyed and stained any color to add a fresh spin on any kitchen. Concrete fits best with more modern or industrial spaces, so keep the ambiance of the room in mind if you go concrete. Easily the most durable of the group, stainless steel can tell many different stories. Whether your kitchen is modern, industrial or minimal, stainless steel fits the mold of all three. The surface is extremely easy to clean, is naturally anti-bacterial and requires no sealing. This surface is low maintenance and defies the traditional look of granite countertops. Quartz is essentially a faux granite or marble surface that is extremely resistant to stains and scratches. A standout feature of quartz in contrast to it’s more expensive counterparts is the fact that it’s much more durable and comes in a variety of colors and styles which makes blending your countertop with the rest of the kitchen a pain free task. Tile countertops are perfect for those who want a unique design while putting an emphasis on style and versatility. Tile is heat and stain resistent but susceptible to cracking, scratching and chipping. If you decide to pursue tile countertops, be sure to order extra tiles for easy repair.